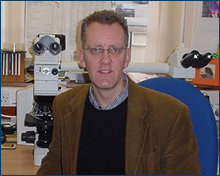 Dr Sanders graduated from Dundee Medical School in 1983 and carried out general cellular pathology training at Ninewells Hospital, Dundee. He has been a Consultant Histopathologist in the West Midlands since January 1992 having been appointed to the GI pathology post at the General Hospital Birmingham and subsequently at the QEH Birmingham, working with surgical and medical GI colleagues Prof J Alexander Williams, Prof M Keighley, Prof R Allen and Prof M Langman as part of the Regional referral centre for inflammatory bowel disease. Dr Sanders has a career- long interest and particular expertise in gastrointestinal pathology and skin tumour pathology and has a regional and national reputation in these areas. He has a proven research track record with over 70 peer reviewed papers in pathology journals largely on GI and skin topics. Dr Sanders has served 2 terms as a committee member of the Pathology section of British Society of Gastroenterology and is a member and regular presenter at the Midlands GI Society. He is currently lead pathologist for the AspECT Barrett's chemoprevention trial and West Midlands pathology lead for the National Bowel cancer screening programme. Dr Sanders participates in the Specialist GI EQA, bowel cancer screening EQA, and West Midlands general EQA schemes.